Have you guys ever heard of hygge? It’s the Danish word for cozy, but it’s also so much more: it’s feeling, a mood, a warm mug filled with your favorite tea on a rainy day, tucked under a fluffy blanket with your favorite person. Hygge is taking a regular everyday occurrence and infusing it with meaning. It’s one of the prevailing forces in my life and I’m obsessed. 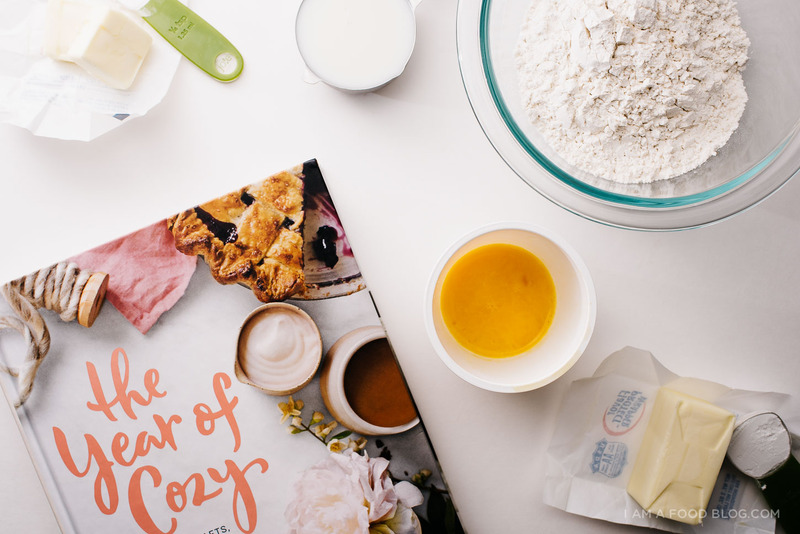 If you, like me, adore the idea of hygge and the whole coziness of being, you’ll likely be obsessed with my dear friend, Adrianna, and her new book, The Year of Cozy. It’s full of small (and big!) ways of making your life just that much more cozy. Of course, there’s nothing cozier than something baking, especially in the fall. It’s been lightening storming a ton over here – complete with torrential rain. I’ve been taking advantage of the stormy atmosphere by baking up a storm. 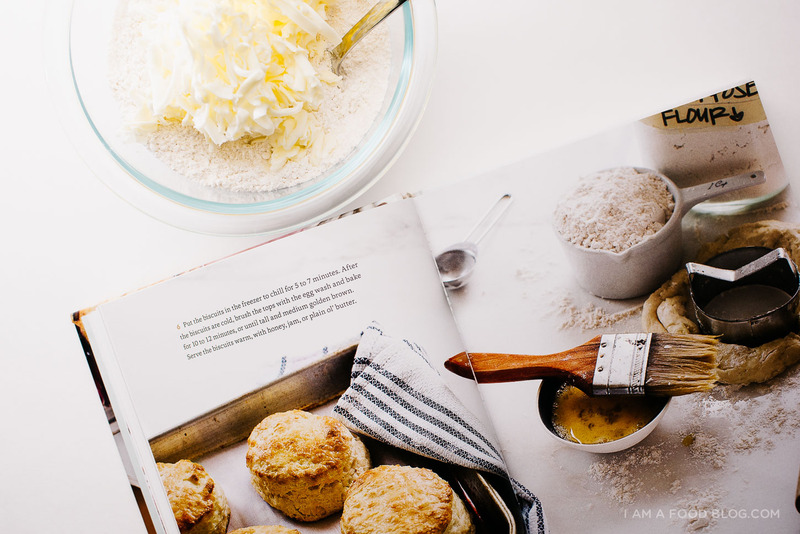 These buttermilk biscuits whipped up in a flash. 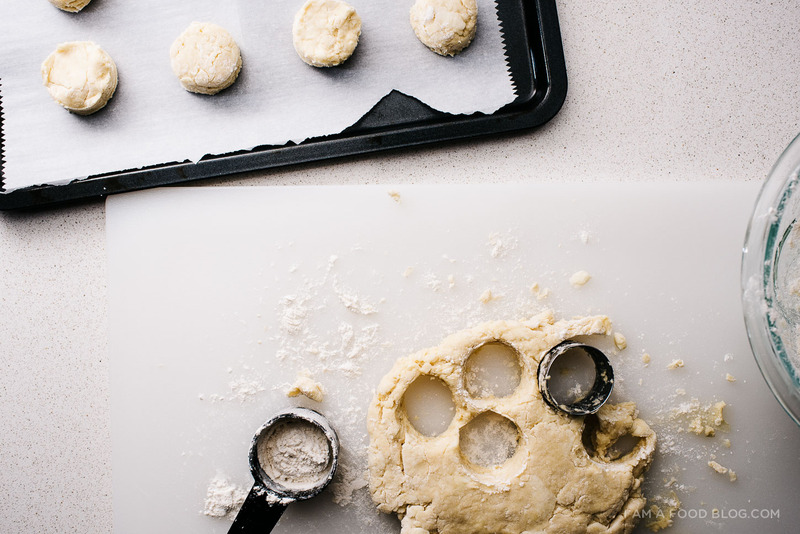 They use my most favorite method of making biscuits – by grating frozen butter. It’s the absolute best way to get chunks of butter evenly distributed in your dough. 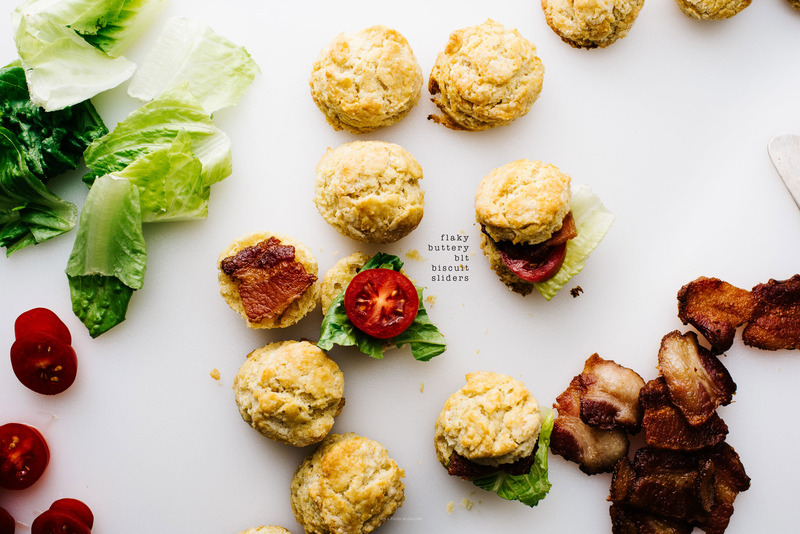 Tiny chunks of butter that aren’t incorporated completely are how you get tall and fluffy biscuits. The butter explodes in the hot hot heat of the oven, forcing the dough into flaky layers. 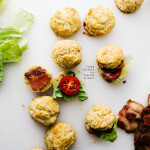 These biscuits are delicious on their own, but I couldn’t resist stuffing them with thick-cut bacon, crisp lettuce, and juicy tomatoes. What can I say? I find anything with bacon, lettuce and tomatoes very hygge. Hope you guys are having a cozy-fall so far and happy Sunday! In a large bowl, whisk together the flour, baking powder and salt. With a box grater, grate the frozen butter directly into the flour mix. Gently break up with a fork and toss until the butter resembles small peas. Place in the freezer for 10 minutes. In a small bowl or glass measuring cup, whisk together the buttermilk and egg and stir into the chilled flour mix until just combined. Lightly knead until it comes together into a ball and turn out onto a lightly floured surface. Gently pat to 3/4 inch thick and cut out using a 2 1/2 inch cutter for 8 biscuits, or a 1 inch cutter for 24 minis. Place cut biscuits on prepared sheet. Gently recombine the scraps as needed. 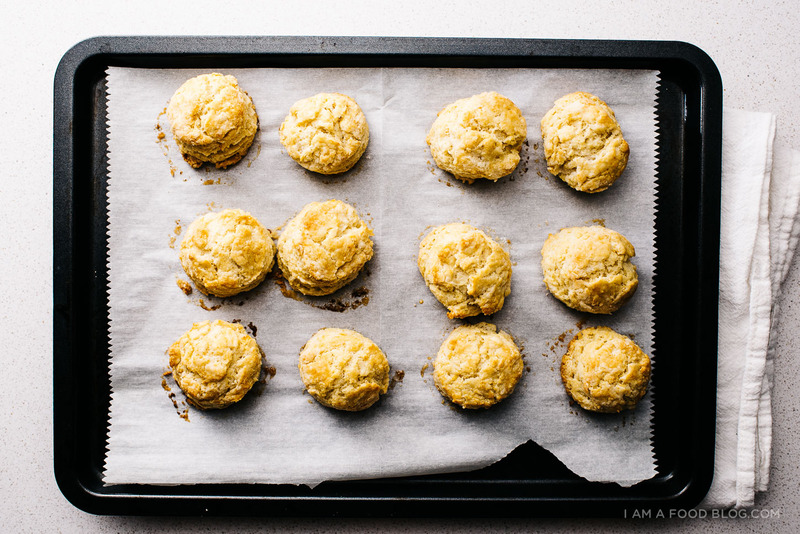 Chill the biscuits for 5-7 minutes on the baking sheet in the freezer. 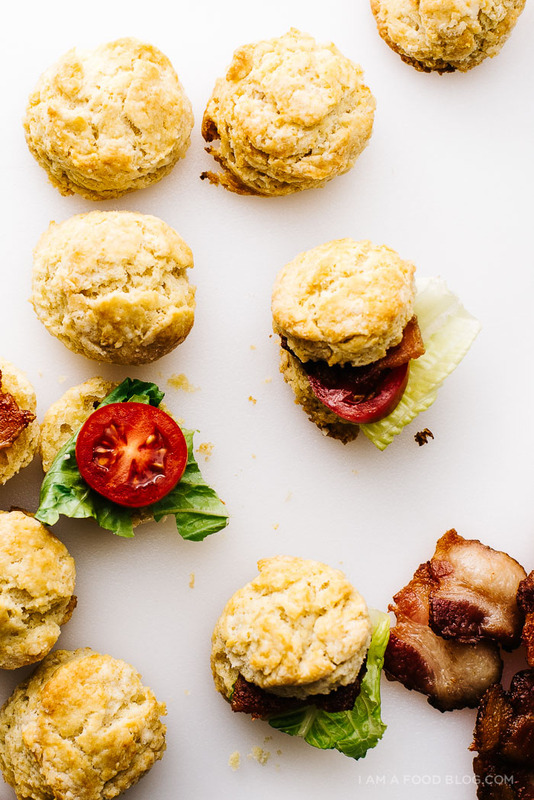 When cold, brush the tops with the egg was and bake until medium golden grown and tall, 10-12 minutes for large biscuits and 8-10 minutes for minis. Enjoy warm! Note: For the BLTs, I just filled them with crispy bacon, lettuce and sliced tomatoes. I didn’t even use mayo. i’d never heard about hygge until you just mentioned it and was so sure it was pronounced “hi-guh.” but i was wrong and it’s “hue-guh,” which sounds like a hug, and i like that so much better. and if biscuits aren’t 1000% cozy and hygge, then i don’t know what is. 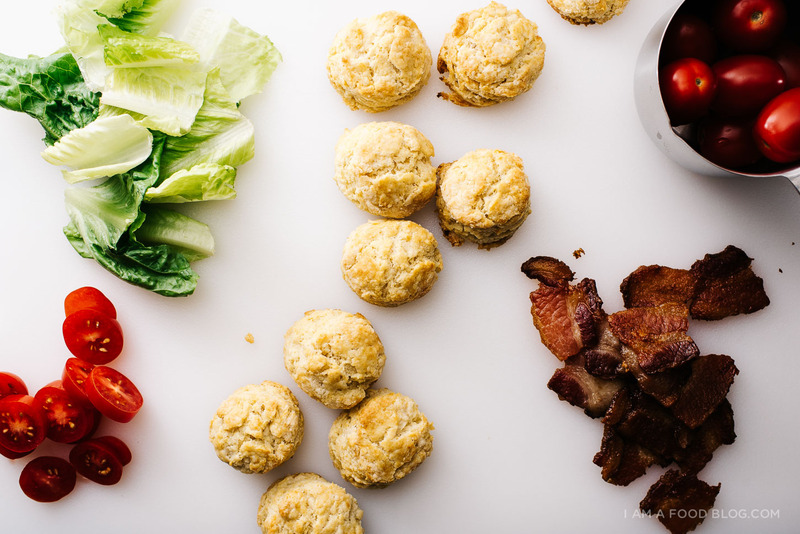 I was actually just thinking recently that I haven’t had a BLT in years, so I think I’ll break that streak by making some of these. Why have I not read that book yet!! Thanks for reminding me….ordering from Amazon now.